I’ve made Pea Soup so many different ways but this was unique because these were fresh peas. I bought a package of fresh organic peas from the market for use in another dish but I forgot. I like to use up what I have so I made this on the fly. It was REALLY different than cooking regular dried peas. Took twice as long. Try to have some patience, it’s worth it. *Also, I use a lot of vegetable stock in my soups and that’s because I am allergic to MSG. If I don’t have time to make my own or buy organic broths, I use vegetable bouillon in water. I also thin out the flavor, since it’s about the ingrediants in it and not the broth. 1 cup of vegetable bouillon*, but chicken or meat stock is good too. Sautee onion in butter until tender. 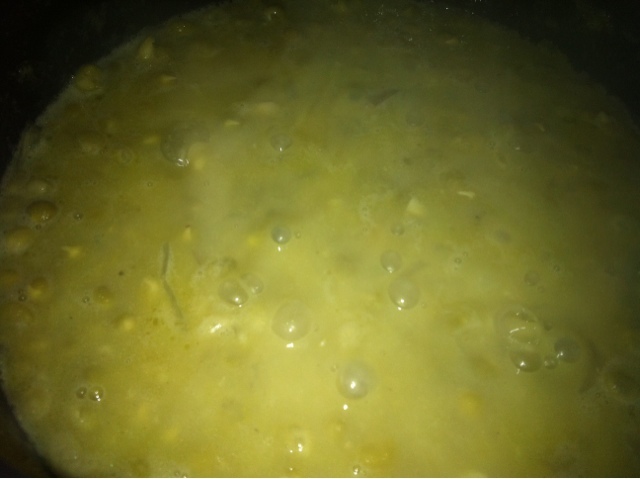 Add peas then water, broth, spices and let simmer – like for an hour. You can tell when the peas are tender and mashable. I like to break them up while they are cooking to thicken up my soup. Since I removed a lot of water, I ended adding it back in the end. Patience is a lesson with this soup. It was totally worth it and wish I had made more. Serves about 6 Bowls.